If you’ve ever worried or wondered what happens to your cat at the vet after you leave the room, our new series: VET Tech 101 is for you. 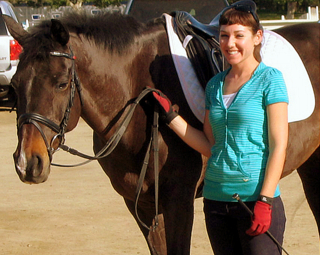 Vet techs are a vet’s right hand, providing assistance and implementing a host of clinical procedures. I feel they do so much and deserve more recognition. This anonymous quote sums up what a vet tech does —I AM an anesthesiologist, a radiology technician, a maid, a surgery assistant, phlebotomist, an ultrasound technician, critical care technician, a loving hand, a pharmacist, a teacher, a shoulder to cry on, friend to cry with, a sucker for a furry face, a face to lick, a midwife, a dental hygienist, a vet’s best friend, a pet’s best friend, a babysitter, a physical therapist, a mother, a playmate, a chew toy, a protector, a cleaner. I CAN make the pain go away, save a life, see what’s wrong, clean anything, ease a mind, fill a drug order, show the right way, end suffering, give kisses, get kisses and clean teeth. I HAVE a strong stomach, endured countless scars, scratches, and bites, cried with a stranger, cried into the fur of too many lifeless bodies, a big heart, a thoughtful mind, the strength to do the right thing even when it hurts, the ability to fall in love in 5 seconds, and the deepest love for all creatures. My wallet is ALWAYS empty, but my house is ALWAYS full & there is ALWAYS room for one more baby to save. I AM A VETERINARY Technician & proud of it! Our guest post is by Georgia Barbush a registered vet tech from California. 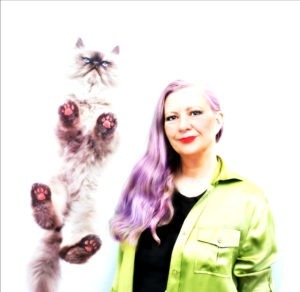 She also happens to be the owner of Peach Industries maker of fab eco-friendly pet products. Their awesome cat lounger is our current giveaway. What Happens When My Cat Needs Anesthesia? No matter how much you trust your veterinarian, leaving your cat at the clinic for a procedure requiring anesthesia can be scary. Understanding the process can help to ease your worry and inform the decisions you make. While veterinary clinics are not required to adhere to the level of care I will describe, these are the standards recommended by educators and regulatory organizations in the veterinary profession and they are maintained by excellent hospitals. Never hesitate to ask your veterinarian questions or request a tour of the facility. A well-run hospital has nothing to hide from its clients. Preparing for anesthesia typically begins by withholding food and sometimes water the night before the procedure. When you arrive at the clinic, the staff should check to confirm that your cat has not eaten for the period of time prescribed. Your veterinarian will then perform a physical exam, checking weight and vital signs and looking for any signs of infection or other disease that could require postponing the procedure. If your cat has not had blood work done recently (6 months at most), a technician will collect a blood sample and run in-house lab work for the veterinarian to evaluate before the procedure begins. All animals undergoing anesthesia should have an intravenous catheter placed beforehand. In the case of an emergency, lifesaving drugs must often be administered intravenously; having an IV catheter in place can save critical seconds and your cat’s life. An IV catheter also allows fluids to be administered throughout anesthesia, helping to prevent dehydration, maintain adequate blood pressure, and ease anesthetic recovery. Your cat will also receive an injection of pre-anesthetic drugs in order to ease anesthetic induction, lower the required dose of anesthetic, and provide pain relief. Administering pain relievers preemptively can significantly reduce the discomfort an animal feels and the amount of post-operative pain medication needed. When it is time to induce anesthesia, the veterinarian or a licensed veterinary technician will slowly inject an anesthetic drug (most commonly Propofol) through the IV catheter while closely monitoring your cat’s level of consciousness. Next an endotracheal tube will be placed in your cat’s trachea, ensuring an open airway and minimizing the inhalation of saliva and other fluids. Once the ET tube is placed, it will be connected to an anesthetic machine that administers oxygen and anesthetic gas to ensure your cat remains “asleep” throughout the procedure. Lubricant is applied to the eyes, as they remain open during anesthesia and can become dry. The technician will also begin the flow of IV fluids and connect monitoring equipment. At a minimum, your veterinarian should have equipment in place to monitor your cat’s heart rate, respiration rate, blood pressure, pulse, temperature, and blood oxygen saturation. If an incision is required for the procedure, a technician will shave the area to be incised and perform a surgical scrub to minimize the risk of infection. While your veterinarian performs the procedure, a technician will monitor your cat. Having an experienced technician monitor throughout anesthesia allows the veterinarian to focus fully on the procedure itself. While the monitoring equipment is a wonderful aid, it cannot take the place of a skilled technician’s assessment of the actual patient. The technician will check your cat’s eye position, jaw tension, gum color, capillary refill time, vital signs, and reflexes to assess depth of anesthesia and patient condition. Many hospitals keep a written record of this data noted at five minute intervals. Once the procedure is complete, the anesthetic gas will be turned off and your cat will be kept on pure oxygen for about 5 minutes. This helps to clear the gas anesthetic from the system and allow for an easier, safer recovery period. Monitoring equipment should remain in use during this time. Next your cat will be disconnected from the anesthetic machine and moved to a recovery kennel where a technician will continue close monitoring. The ET tube is removed when your cat has recovered a strong swallowing reflex. Recovery is actually one of the most risky periods of anesthesia. Monitoring should continue and the IV catheter should remain in place until all vital signs are within normal limits and your cat is fully alert. Injectable pain medications may be administered during recovery. If needed, an e-collar will be placed to protect incisions or wounds. When you pick your cat up from the clinic, your veterinarian or a veterinary technician should explain the necessary post-operative care, expected recovery time, and answer any questions you have. 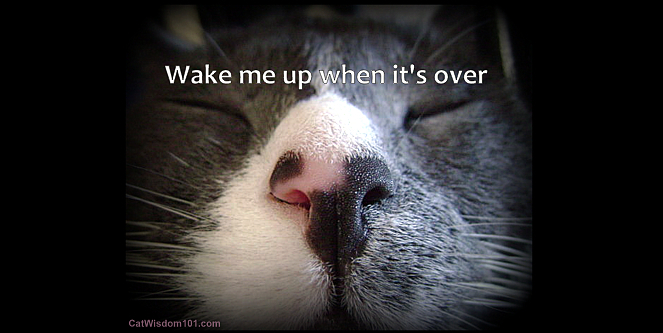 If you have any concerns about your cat’s behavior or physical condition post-anesthesia, contact your veterinarian. While anesthetic procedures always carry a degree of risk, it is often far outweighed by the intended benefits. Veterinary hospitals with high safety standards and skilled staff are well-prepared to handle any emergency that might arise. 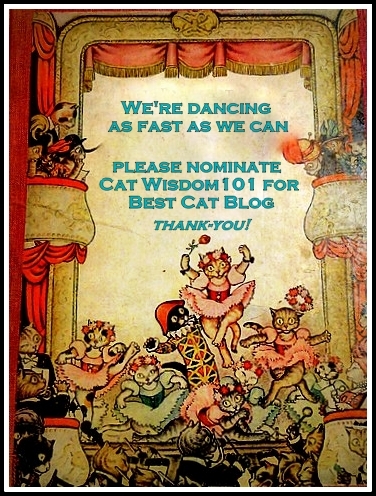 Only two days left to nominate all your favorite blogs and hopefully Cat Wisdom 101! And remember every time you nominate a blog you get the chance to win $10,000 for your favorite shelter. Please let me know if you’re looking for a article author for your weblog. You have some really good posts and I think I would be a good asset. If you ever want to take some of the load off, I’d love to write some articles for your blog in exchange for a link back to mine. Please send me an email if interested. Kudos! That’s a very nice comment from a caring vet. I wish all vets took care of our pets like this vet tech. Our cat Neko has been with us for 22 years now. He recently suffered a stroke and was almost completely paralyzed. The vet couldn’t do anything, and said it is time to let him go. But Neko wouldn’t hear of it. He showed us so much strength, willingness, and determination to get better. Now he is walking and almost back to normal. Please watch this amazing heart felt video of his recovery journey. Thanks for explaining what happens. Its a lot more complicated than we thought! The Girl worked as a vet tech and they do the dirty work too, if there is vomit or poop to clean, bodies to bag. They really are unsung heroes. We just posted about last week’s Vet 101 & an update on MMM. The Vet Tech is indeed all of those things and more! Celebrate them and always thank them because they are truly special people. Thanks for another great post with lots of information. I never realized there was so much to watch for and such. So interesting. Thank you. Thanks so much for this post. Though I began working with a veterinarian in 1973 I finally became a Registered Veterinary Technician in 1981. Who ever that anonymous poster was, she/he was absolutely correct. We are all of those things. Please remember to thank your VT the next time you stop at your veterinarian’s office. It just might help someone get through another day! Thanks Andrea. And yes, show some love to the VT.
That was so interesting – Thanks a lot for this information. Yikes! That going under is always such a scary thing for all of us. Although my human’s boyfriend wasn’t officially a tech when he worked at the clinic, he was there long enough to be able to do a lot of this. He’s a musician full time now, though, and only fills in as a favor when someone is on vacation. Thanks for sharing this, Layla. We liked the way Georgia helped explain the whole anesthesia process. It CAN be scary, so this was so very helpful! This was so informative. Thank you.